If someone is interested in your product but not yet ready to buy, they may want to know more about the offering. This is the perfect opportunity for a 'Book a Demo' form. Giving your website visitors the option to contact someone from your team is the first step to a sale. Create a form and call it something like "Book a Demo with Us!" ( how to create a form). "Enter your details and someone will reach out to you as soon as possible :)"
Drag in a name field, an email field, and a paragraph text field that you can call 'Additional Notes'. Use the Design tab to choose the color of the forms so they fit with your branding. Once you're in the Design tab, you can scroll down in the right-most panel to the Form Type menu. 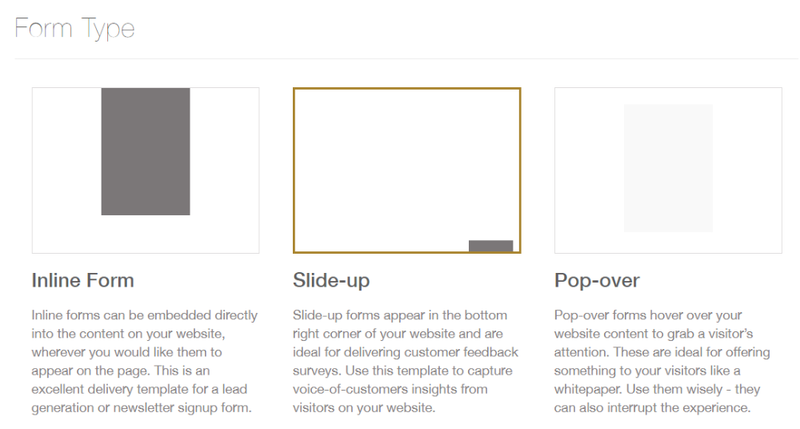 Here you have three choices: inline, slide-up, and hover-over. The final step will be embedding your form on your website! ( Where to find the embed code). Thanks for following along :) Now go out and get more leads! NEXT STEPS: Alert your sales team every time someone books a demo with the Slack Integration.